The electronic rat trap did its job and killed a mouse! Cat sat in front of the sink for a few hours, patiently watching and waiting. When she does this it’s a good sign of a rodent being present. Every time in the past when she does this, either a mouse or a rat shows up. It’s that time of year again where the critters are looking for shelter from the cold. They show up in the garage, and find their way under the house and eventually make their way to the kitchen. I imagine they are finding a gap at plumbing or electrical or gas pipes. Of course there will be other tell tail signs that you’ve got a rodent in the house. You can sometimes hear them behind walls, or in the crawl space or even in the attic. And you’ll often find rodent droppings under the sink or beneath a nice warm spot such as a free standing range. Find the sign and put out the electronic traps. I have two electronic rodent traps I use. The newest and not as proven is the Rat Zapper. It’s a little larger but has similar features as my other trap the Victor Electronic Rat Trap. Both promise easy clean up and no fuss no muss no mess rodent offing. The old spring powered mechanical traps often maim but not kill the rodent, and just as often if not more, make a big mess. It’s disgusting. So under the sink goes the RatZapper, and the Victor Electronic Rodent trap. 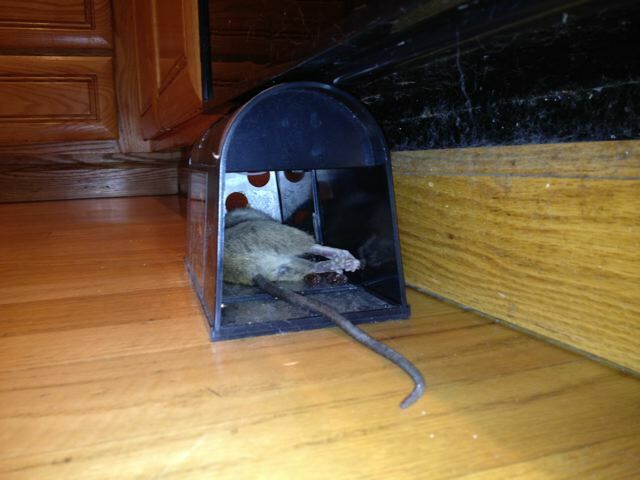 I usually put the traps parallel to the wall since rodents seem to travel around a room or cupboard in this way. They hug the perimeter, and this is where you should put your traps. Both electronic killing machines got almonds and buttered toast as bait. I find a variety of baits work. Peanut butter, peanut butter studded with cat food, cheese, slices of apple, nuts, crackers, bread etc all do their work at one time or another. Sometimes a bait doesn’t work. Just swap it out for something else. I had one rat in the garage that was impossible to catch until I used a slice of salami to finally shock that sucker into permanent sleep. The Rat Zapper was the trap that got its victim, a fat mouse. Posted in Electronic Rat and Mouse Traps, Mouse Trap, mouse zapper, Rat Trap, rat zapper, Rodent Control, Victor Electronic Rodent Trap, Victor Mouse Trap, Victor Rat Trap. Decided to get another electronic rat and mouse trap since fall is here and winter rains are on their way. With the cold and wet, the mice and rats will try to get in to the garage, and eventually make their way under the floors, to the warm cozy kitchen where they can find food. One rat trap is not enough. Since the Victor Rat Trap was less than perfect, thought I’d give a Rat Zapper a go, and while I”m at it review it. 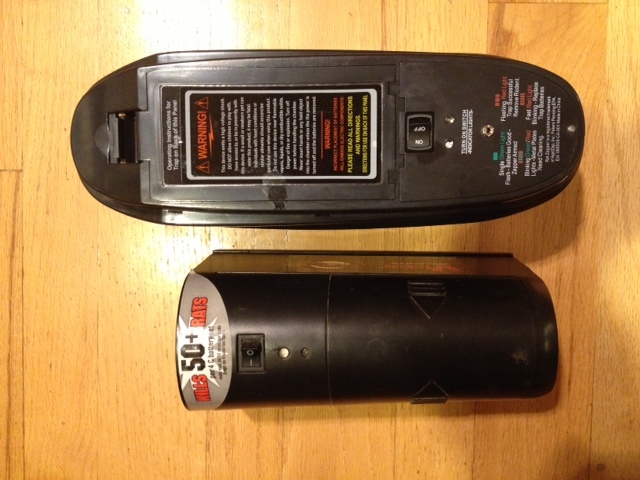 The Rat Zapper is heavier than the Victor Electronic Mouse – Rat trap, and larger. Neither trap is particularly grippy, meaning those with smaller hands, and dry skin will have trouble keeping hold of the traps, especially with the Rat Zapper. The Packaging is minimal, a simple cardboard box, easy to open, and if need to store the Rat Zapper. The box indicates that 4 D-sized batteries are required, and that they can give you up to one year for stand by use. The Rat and Mouse Zapper packaging does give a consumer quite of bit of information on the outside of the package, including a quick start guide to using your new Rat and Mouse Zapper. 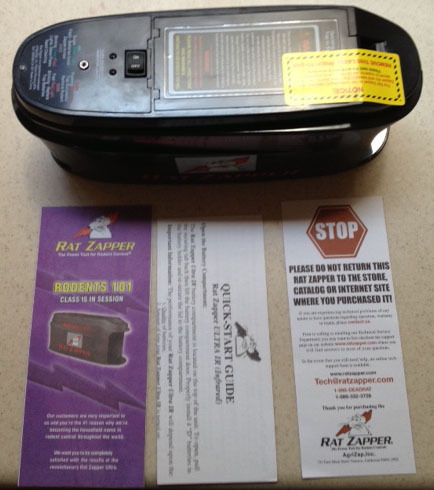 Unlike the Victor Electronic Rat Trap I bought the Rat Zapper Electronic rodent trap provides printed instructions inside of the box, as well as a trouble shooting guide, and instructions on getting technical support and repairs as need be. The instructions also tell you how to safely clean the rat zapper machine, and how to bait it, and where to place it for optimal results. Again, the Victor Mouse and Rat Trap does not come with these simple instructions. It makes me wonder if somehow the packaging of my Victor Mouse Trap was somehow lacking in supplied literature, warranty and instructions. Over the years I’ve determined that some rodents are pickier than others when it comes to bait. I have used peanut butter, salami, raisins, bread, crackers, cheese, dog food, cat food, smoked tuna, fresh apples and pears, etc all with varying success. 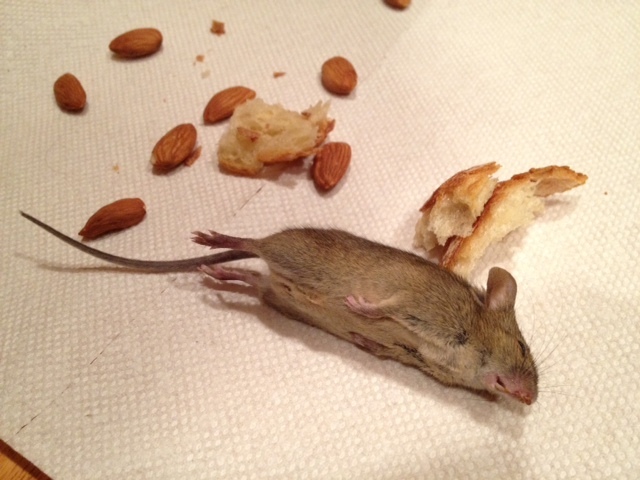 Peanut Butter tends to be a consistent performer for rat and mouse bait. But on those days when I know there are varmints in the house or garage. Posted in Electronic Rat and Mouse Traps, Mouse Trap, mouse zapper, Rat Trap, rat zapper, Rodent Control, Squirrel Trap, Victor Electronic Rodent Trap, Victor Mouse Trap, Victor Rat Trap. 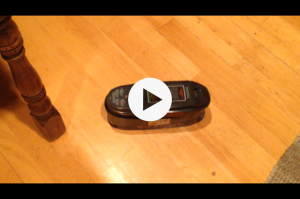 I have changed my opinion on the Victor electronic mouse trap. I have caught about half a dozen rats, and perhaps a dozen mice, or baby rats since I started using this high tech mouse trap. It zaps the mice and rats quite well most of the time. Occasionally a larger rat will survive, and only be stunned, but this appears to be an anomaly. And yes I did get a bit of a shock the first time I used it, but it was a mild shock, and now I know to hold the trap only by the plastic parts, and to not handle the trap while it is energized. I have experimented quite a bit with various baits to use in the Victor Mouse Trap. Peanut butter is the tried and true bait that mostly works. Sometimes the rodents don’t seem quite so interested in the peanut butter, and so I will use bits of cooked or not cooked meat, including chicken, beef and fresh tuna. I have also used smoked tuna, chicken scratch, bread, cheese, fruit including apples and pears. One particular week I knew we had a rodent, as the dog and the cats all were interested in something under the stove. Nothing seemed to lure the rodent out though. Finally I spied some raisins on the floor that kids had dropped, thought to myself, I’ll bet these work. Tried it and that night I scored with a fresh kill. I still have a gripe that the victor rodent trap is not easy to clean, and so I reach out to Victor to improve their design so that it is easy to clean the trap. And also to improve on the electronics by having an internal battery indicator to let you know when the batteries are low, and to make it impossible or at the very least difficult for humans to get shocked. The Victor Trap is not perfect, but it mostly works, and works exceptionally well for smaller mice and rats. Get a great deal on a Victor Electronic Rat Trap at Amazon.